Secretary of the State Denise Merrill’s office said on Thursday that another state Senate race will be subject to a recount. 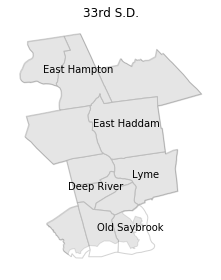 State election officials said a recent correction to a reporting error in Essex has put the contest for the 33rd District within a margin that requires a recount. The new tally leaves Essex’s Democratic First Selectman Norm Needleman leading East Haddam Republican state Rep. Melissa Ziobron by 137 votes. John Heiser of the Essex Registrar of Voters office said they submitted the wrong totals to the Secretary of the State’s office on election night. Initial returns reported to the secretary of the state showed Needleman outpolling Ziobron by 303 votes. Merrill’s office has called for a district-wide recount and is giving local town election officials until Monday to finish.